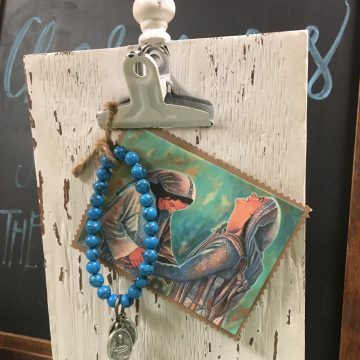 There is a tradition that Mary appeared to St. Simon Stock, a Carmelite monk, and gave him the brown scapular in 1251, telling him to promote devotion to it. The scapular is a modified version of Mary’s own garment. 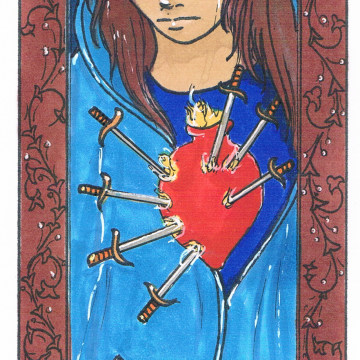 It symbolizes her special protection and calls the wearers to consecrate themselves to her in a special way. My parent’s church is Our Lady of Mount Carmel, and my mother asked for this special scratchboard. It’s best to always say yes to your mother, right? 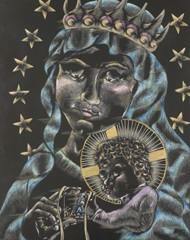 Museum quality Giclee print from an original scratchboard of Our Lady of Mount Carmel. Each archival print is hand signed by the artist and sold unframed and shipped flat. As I decide what image to carve, I pray. I listen. I open up to the grace of GOD. I hear those around me and the quiet voice that guides me from image to image. I read about and sketch my saint; I pray to my saint and spend time in silence pondering the life, love, and words of my saint. I begin on their board, and it becomes an active and alive time. The noise of everyday living; the barking of dogs, the footfalls of family, the noise of life, all come into the living image that develops before me. GOD transforms daily living activity to this active and living artwork. Out of the inky darkness, GOD guides my hand and pulls saints into light. The love of the Holy Spirit moves through the image in rays, transforming the static image into a moving reflection of GOD’s love. The love of the saint for GOD shines from their faces. Each line is lovingly laid. Each color is carefully chosen. HIS saints glorify the LORD. These saints will move HIS people to prayer and reflection. Pull each viewer from dark into light. Laughter, prayer, joy, activity; it is all included, it is all poured forth. Finished now. Time to listen again. I hope my statement above gives you some idea of the process I use to produce my scratchboard images. 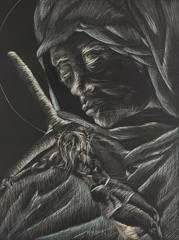 I feel the medium of scratchboard, while difficult, provides an apt metaphor of moving from dark to light. The board I begin with is black as night, which transforms with the presence of the saint into light and color. I must be disciplined as I work, since damage and carelessness cannot be removed, only forgiven then incorporated into the final image presented. The boards also move from MINE to HIS-I don’t really know how or when, but at some point it is no longer about me, but about GOD and becomes HIS. I have found a wonderful printer who makes Giclee prints of the scratchboards that are moving and accurate, right down to the smallest line. I own each original yet, and delight in showing them. The 3 dimensional carving of the board makes the originals interesting to look at. I love when people press their noses right up to the image to look into the line!